I’ve been experimenting with refrigerator lemon pickles for a couple of years now. Tonight I wanted to work with lemon and other Japanese flavors, but didn’t have any preserved lemons in the fridge. Rather than put off using up some fresh shiso I had on hand, I decided to experiment with using other methods to infuse lemon flavors, plus make a garnish of the fresh lemon as well. First I sliced up a large lemon in very thin slices. You might want a mandoline to get very thin slices, but it can be done with a very sharp knife (I used my nakiri). I layered the slices onto a plate then layered thick slices of extra-firm, water-packed tofu I’d pressed for 40 minutes, on top of the lemons. I sprinkled on a little Alaea salt and black sesame seeds. I let this sit for 15 minutes. I heated up a cast iron skillet on medium-low heat and added a few tablespoons of avocado oil and let it heat up. I put the tofu sesame-side down into the hot oil and then layered the sliced lemons over the top of the tofu. It seared in a covered pan for 12 minutes before removing the lemon slices (reserve), spraying the tofu with oil, and flipping the slices over. Lemon slices where placed back onto the tofu slices and pan covered to let tofu sear for another 12 minutes. I removed the lemon slices and set aside. Into the pan I poured half of a mix of rice wine vinegar, tamari, red miso, and mirin over the tofu and let the liquid reduce in the pan. Once all liquid had reduced I removed tofu from the pan and added back in the lemon slices. These were spread out in the bottom of the pan to sear lightly for a couple of minutes before turning to sear on the other side. Once both sides had seared I added the rest of the sauce I’d mixed and let it reduce with the lemons. 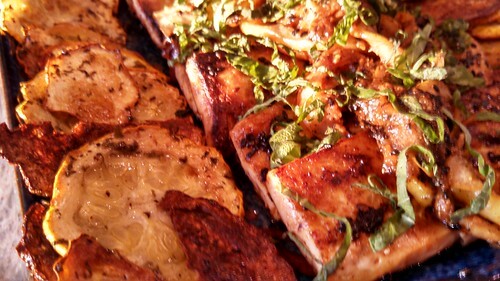 The whole thing was presented with the hot lemon relish topping the seared sesame tofu and a chiffonade of fresh shiso. There was also some summer squash chips made with thin slices of patty-pan squash tossed with dried cilantro, avocado oil, and Alaea salt. These roasted on a pan in the oven on convection setting, 235 degrees. 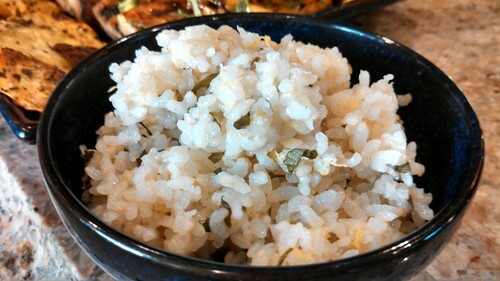 All this was accompanied with brown rice tossed with lemon zest and shiso. We ate all of it. It was amazing. There will be recipes.